Is this suitably Kitsch with the candy stripe frame? Hope so! Did you write to Santa with your Christmas wishes when you were a child? I certainly did. As far as I can recall I’d be asking for things. Certain toys (Lego!) or maybe a pet! Sometimes my wishes were met other times not. I can’t remember how old I was when I wrote my last letter to Santa - how about you? Can you remember the last thing you asked Santa for? I do think about these letters to Santa at this time of year as I see my nieces and friend’s children continuing this tradition. 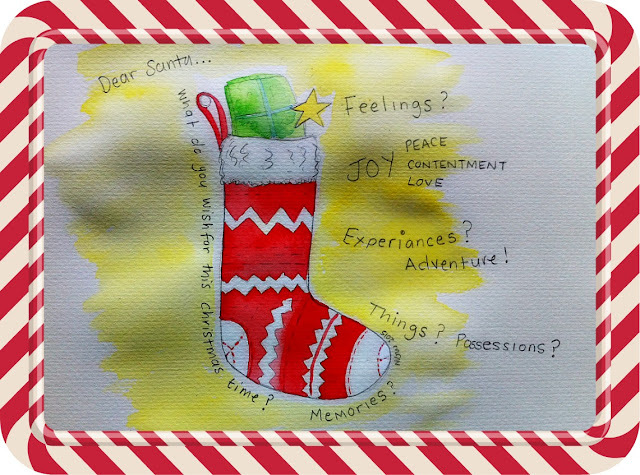 It also makes me wonder – If I was to write a letter to Santa this year what would I wish for? Would I wish for things? Or feelings? Or Experiences? What would I like to see in my Christmas stocking? How about you? What do you wish for this Christmas? Would it be things or experiences? Maybe half an hour to yourself? Re-igniting a lost dream you have kept buried that’s starting to glimmer again? Travelling more? Writing that book? Changing your job? Spending more time with family? A simpler life with less stuff? Finishing the projects you’ve started? Or even starting a project you’ve been thinking about? Or.....? Take out a sheet of notepaper (the nicest you have) and write a letter to Santa (or the Universe or God or Goddess whatever works for you) this year with your wishes. I’ll be doing just this myself and tucking myself away to reflect on the year that’s been and my wishes, hopes and dreams for 2016. Before I go into my warm cosy hibernation cave I want to say a huge thank you for being a part of this adventure so far and I look forward to new adventures with you in 2016. Wishing you a Merry Christmas and a Joyful New Year. ps I'd love to hear what your wishes are so do drop me a note if you'd like to share.